We describe an efficient method to separate single-stranded DNA, double-stranded DNA and RNA molecules from environmental viral communities. Nucleic acids are fractionated using hydroxyapatite chromatography with increasing concentrations of phosphate-containing buffers. This method permits the isolation of all viral nucleic acid types from environmental samples. Fadrosh, D. W., Andrews-Pfannkoch, C., Williamson, S. J. Separation of Single-stranded DNA, Double-stranded DNA and RNA from an Environmental Viral Community Using Hydroxyapatite Chromatography. J. Vis. Exp. (55), e3146, doi:10.3791/3146 (2011). Viruses, particularly bacteriophages (phages), are the most numerous biological entities on Earth1,2. Viruses modulate host cell abundance and diversity, contribute to the cycling of nutrients, alter host cell phenotype, and influence the evolution of both host cell and viral communities through the lateral transfer of genes 3. Numerous studies have highlighted the staggering genetic diversity of viruses and their functional potential in a variety of natural environments. Metagenomic techniques have been used to study the taxonomic diversity and functional potential of complex viral assemblages whose members contain single-stranded DNA (ssDNA), double-stranded DNA (dsDNA) and RNA genotypes 4-9. Current library construction protocols used to study environmental DNA-containing or RNA-containing viruses require an initial nuclease treatment in order to remove nontargeted templates 10. However, a comprehensive understanding of the collective gene complement of the virus community and virus diversity requires knowledge of all members regardless of genome composition. Fractionation of purified nucleic acid subtypes provides an effective mechanism by which to study viral assemblages without sacrificing a subset of the community’s genetic signature. Hydroxyapatite, a crystalline form of calcium phosphate, has been employed in the separation of nucleic acids, as well as proteins and microbes, since the 1960s11. By exploiting the charge interaction between the positively-charged Ca2+ ions of the hydroxyapatite and the negatively charged phosphate backbone of the nucleic acid subtypes, it is possible to preferentially elute each nucleic acid subtype independent of the others. We recently employed this strategy to independently fractionate the genomes of ssDNA, dsDNA and RNA-containing viruses in preparation of DNA sequencing 12. Here, we present a method for the fractionation and recovery of ssDNA, dsDNA and RNA viral nucleic acids from mixed viral assemblages using hydroxyapatite chromotography. Before performing hydroxyapatite chromatography, phosphate buffers must be prepared and the hydroxyapatite must be properly hydrated. 1M Phosphate Solution, pH 6.8: In a 1L flask dissolve 119.98g of sodium phosphate monobasic in 1L of sterile, DEPC-treated H2O. Prepare a 1M sodium phosphate dibasic solution in a 1L flask by dissolving 141.96g of sodium phosphate dibasic in 1L of sterile, DEPC-treated H2O. Combine the mono- and di- solutions at a ratio of 1:1. Place flask on a stir plate and mix using a magnetic stir bar. Adjust pH to 6.8 by adding sodium hydroxide (to increase pH) or phosphoric acid (to decrease pH). 0.12M Phosphate Buffer: In a 500ml flask, combine 30ml of 1M Phosphate Solution, pH 6.8, 2.5ml of 10% sodium dodecyl sulphate (SDS), and 5ml of 0.5M EDTA. Add sterile, DEPC-treated H2O to a volume of 225ml. Adjust pH to 6.8. Add sterile, DEPC-treated H2O to 250ml. Autoclave. 0.18M Phosphate Buffer: In a 500ml flask, combine 45ml of 1M Phosphate Solution, pH 6.8, 2.5ml of 10% sodium dodecyl sulphate (SDS), and 5ml of 0.5M EDTA. Add sterile, DEPC-treated H2O to a volume of 225ml. Adjust pH to 6.8. Add sterile, DEPC-treated H2O to 250ml. Autoclave. 0.20M Phosphate Buffer: In a 500ml flask, combine 50ml of 1M Phosphate Solution, pH 6.8, 2.5ml of 10% sodium dodecyl sulphate (SDS), and 5ml of 0.5M EDTA. Add sterile, DEPC-treated H2O to a volume of 225ml. Adjust pH to 6.8. Add sterile, DEPC-treated H2O to 250ml. Autoclave. 0.40 M Phosphate Buffer: in a 500ml flask, combine 100ml of 1M Phosphate Solution, pH 6.8, 2.5ml of 10% sodium dodecyl sulphate (SDS), and 5ml of 0.5M EDTA. Add sterile, DEPC-treated H2O to a volume of 225ml. Adjust pH to 6.8. Add sterile, DEPC-treated H2O to 250ml. Autoclave. “1.00M Phosphate Buffer” (actual concentration of phosphate in this solution is .91M): In a 500ml flask, combine 30ml of 1M Phosphate Solution, pH6.8, 2.5ml of 10% sodium dodecyl sulphate (SDS), and 5ml of 0.5M EDTA. Add sterile, DEPC-treated H2O to a volume of 225ml. Adjust pH to 6.8. Add sterile, DEPC-treated H2O to 250ml. Autoclave. Hydroxyapatite hydration: Weight out 1g of hydroxyapatite and add to a 50ml tube. Add 6ml of 0.12M phosphate buffer to the hydroxyapatite and invert to mix. Prior to use bring temperature to 60°C and mix thoroughly. Store for extended periods of time at 4°C. Prior to use, equilibrate all phosphate buffers and hydrated hydroxyapatite at 60°C. Close stopcock. Rinse column several times with deionized H2O by repeatedly inverting the column and decanting. Remove the stopcock from the Econo-column and autoclave the column to sterilize. Replace and close stopcock. Add 1ml of Sigmacote to the sterile Econo-column and coat all glass surfaces. Open the stopcock and decant. Attach column to a circulating water bath and set temperature to 60°C. To einsure the least amount of heat loss across the column wrapping the column in an insulating agent such as aluminum foil or foam pipe insulation is recommended. Rinse the Econo-column twice with sterile, RNase-free H2O then twice with sterile, RNase-free 0.12M Phosphate Buffer. Making sure the stopcock is closed, slowly add 2ml of pre-prepared, resuspended hydroxyapatite to the bottom of the Econo-column using a sterile 2ml serological pipette. Allow the hydroxyapatite to settle under the force of gravity for 30 minutes. Drain buffer from column and close stopcock. Combine nucleic acids with 0.12M phosphate buffer in a final volume of 500 μl and incubate at 60°C for 10 minutes in a heat block or water bath. Quickly apply nucleic acids prepared in 0.12M phosphate buffer to the hydroxyapatite using a 2ml serological pipette making sure not to disturb the column. Allow the nucleic acids to bind to the hydroxyapatite for 30 minutes. Place a 15ml tube under the column, open the stopcock and collect the initial sample containing ssDNA. Close stopcock. Add 6ml of 0.12M phosphate buffer to the hydroxyapatite making sure not to disturb the column, open the stopcock, and collect single-stranded DNA in the 15ml tube from the previous step. Close stopcock. Add 1 volume of a phenol:chloroform:isoamyl alcohol (25:25:1 v/v/v) solution to the tube, mix vigorously and centrifuge at 3500 x g for 15 minutes. Transfer supernatant containing ssDNA to a new 15ml tube. Repeat 3.76 and 3.87 using 6ml of 0.20M phosphate buffer to elute and purify RNA from the column making sure to use a new 15ml tube for collection. Repeat 3.76 and 3.87 using 6ml of 0.40M phosphate buffer to elute and purify dsDNA from the column making sure to use a new 15ml tube for collection. Repeat 3.76 and 3.87 using 6ml of 1.00M phosphate buffer to strip the column of any residual dsDNA making sure to use a new 15ml tube for collection. Transfer 4-5ml of sample to an Amicon Ultra-4 centrifugal filter device outfitted with a 30,000 molecular weight cut off Ultracel membrane. Concentrate sample to < 500μl by spinning at 6,000 x g, 30°C, 5 minutes (or until concentrated volume is achieved) in a fixed angle rotor. Discard flow through. Add the remainder of the sample(s) to the Amicon Ultra-4 centrifugal filter device and bring the volume up to 4-5ml with Rnase free 1X TE Buffer. Add 4-5ml of Rnase free 1X TE Buffer to the Amicon Ultra-4 centrifugal filter device. Concentrate sample to < 500μl by centrifuging at 6,000 x g, 30°C, 5 minutes (or until concentrated volume is achieved) in a fixed angle rotor. Discard flow through. Repeat step 4.5 an additional 5 times to completely desalt nucleic acid sample(s). Transfer remaining sample(s) to a sterile 1.7ml eppendorf tube. Add 1/10th volume 3M sodium acetate, pH 7.0, two volumes of 100% ethanol, and 1μl of Glycoblue. Mix well by vortexing. Centrifuge at 28,000 x g, 4°C, 60 minutes. Decant making sure not to disturb the pellet. Add 300μl of 70% ethanol. Spin at 28,000 x g, room temperature for 10 minutes. Decant, dry and resuspend each fraction in an appropriate volume of Rnase-free TE buffer. Figure 1 summarizes the methods presented for using hydroxyapatite chromatography to fractionate ssDNA, dsDNA and RNA nucleic acids from a mixed viral assemblage. This method exploits the charge interaction between the negatively charged phosphate backbone of the nucleic acids and the positively charged Ca2+ ions present in the hydroxyapatite and allows for the efficient fractionation of nucleic acid subtypes (ssDNA, dsDNA and RNA) with increasing phosphate buffer concentrations 12. The hydroxyapatite fractionation of an in vitro “community” of known ssDNA (M13mp18), dsDNA (lambda) and RNA (MS2 and phi6) viral genomes is illustrated in Figure 2. The nucleic acids were combined in equal concentrations, applied to the hydroxyapatite column and were eluted using an increasing concentration of phosphate buffer. Each nucleic acid subtype elutes independent of the others with less than 9% carry-over from one fraction to the next. The application of this technique to nucleic acids isolated from a viral community collected from the Chesapeake Bay is shown in Figure 3. The total nucleic acid yield isolated from purified viruses was applied to the hydroxyapatite column. Genomic material consisting of ssDNA, RNA and dsDNA was independently eluted with 0.12M, 0.20M and 0.40M/1.00M concentrations of phosphate buffer respectively. Double-stranded DNA is eluted at phosphate concentrations of 0.40M and 1.00M and in this case, dominates this viral community compared to ssDNA and RNA genotypes. This observation is consistent with the expected viral community composition of marine and estuarine environments where the majority of recoverable nucleic acids are dsDNA 13. Figure 1. Flow diagram of the hydroxyapatite chromatography method for the fractionation of nucleic acids. 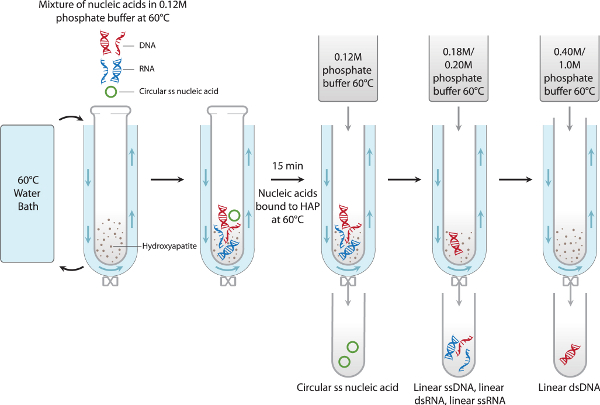 A mixture of ssDNA, dsDNA and RNA prepared in 0.12M phosphate buffer is heated to 60°C and applied to a hydroxyapatite column maintained at a constant 60°C using a circulating water bath. Nucleic acids (ssDNA, RNA and dsDNA) are eluted from the hydroxyapatite with increasing concentrations of a phosphate-containing buffer. This figure has been reproduced with permission from American Society of Microbiology and was originally featured in Andrews-Pfannkoch et al. 201012. Figure 2. Separation of known viral nucleic acids using hydroxyapatite chromatography. 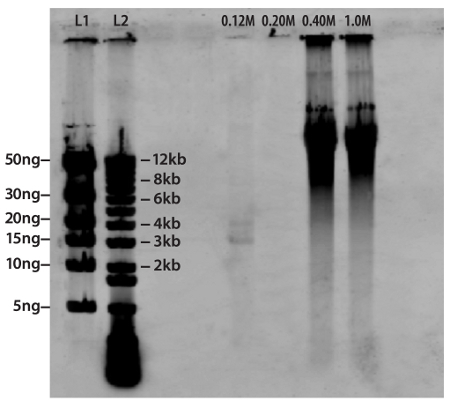 Equal concentrations of M13mp18 ssDNA, MS2 ssRNA, phi6 dsRNA and lambda dsDNA (lanes 2-5, respectively) were combined (lane 6) and applied to a hydroxyapatite column. Single-stranded DNA (M13mp18), RNA (MS2/phi6) and dsDNA (lambda) were independently eluted from the hydroxyapatite column using 0.12M (lane 8), 0.18M (lane 9) and 0.40M/1.00M (lane 10). A 1kb ladder (lanes 1, 7) was used to confirm genome sizes. This figure has been reproduced with permission from American Society of Microbiology and was originally featured in Andrews-Pfannkoch et al. 201012. Figure 3. Separation of viral nucleic acids isolated from a community within the Chesapeake Bay. Nucleic acids were isolated and applied to a hydroxyapatite column. ssDNA(lane 0.12M), RNA (lane 0.20M) and dsDNA(lanes 0.40M/1.0M) were independently eluted using phosphate buffer concentrations of 0.12M, 0.20M and 0.40M/1.00M, respectively. Hi Mass DNA Ladder (lane L1) and 1kb Ladder (lane L2) were used to visually confirm approximate molecular weight and mass of nucleic acids. This figure has been reproduced with permission from American Society of Microbiology and was originally featured in Andrews-Pfannkoch et al. 201012. The hydroxyapatite chromatography methodology presented here is a highly efficient and robust tool for the fractionation of nucleic acids from mixed viral assemblages, when the goal is to study the total nucleic acid composition of the community. Generally, ssDNA, RNA and dsDNA will elute from the column pho phosphate buffer concentrations greater than approximately˜ 0and 0.40M respectively. However, each preparation of hydroxyapatite can have a slightly different composition and elution profile so it is important to test each preparation using known nucleic acids (e.g. from a cultivated virus preparation). This will allow the user to ascertain the specific concentrations of phosphate-containing buffers needed to elute the desired nucleic acids. A limiting factor of this technique is the quantity of available Ca2+ ions present in the hydroxyapatite that can bind the phosphate backbone of the nucleic acids. The capacityamount of the hydroxyapatite in the column can be scaled up or down to column (dictated by the size of water-jacketed column and amount of hydroxyapatite used) and the volume of buffers used for elution can be scaled up or down to accommodate very small or very large quantities of input nucleic acids, but is ultimately limited by the size of the water-jacketed column. Additionally, a batch technique where the nucleic acids, hydroxyapatite, and phosphate-containing buffers are combined in a tube, mixed, and centrifuged at low speed is an alternative way of isolating targeted nucleic acids. This strategy may be beneficial in some instances, but is not as reliable as the chromatographic methods which are more accurate and provide better fractionation of nucleic acids. This research was supported by the Office of Science (BER), U.S. Department of Energy, Cooperative Agreement no. De-FC02-02ER63453, the National Science Foundation’s Microbial Genome Sequencing Program (award numbers 0626826 and 0731916 ). We thank John Glass for his technical expertise and advice and K. Eric Wommack for his assistance with environmental sample collection. Whitman, W. B., Coleman, D. C., Wiebe, W. J. Prokaryotes: The Unseen Majority. Proceedings of the National Academy of Sciences of the United States of America. 95, 6578-65 (1998). Hendrix, R. W. Bacteriophages: evolution of the majority. Theor Popul Biol. 61, 471-471 (2002). Weinbauer, M. G. Bacteriophages: Evolution of the Majority. FEMS Microbiol Rev. 28, 127-127 (2004). Dinsdale, E. A., Edwards, R. A., Hall, D. Functional Metabolic Profiling of Nine Biomes. Nature. 455, 830-830 (2008). McDaniel, L., Breitbart, M., Mobberley, J. Metagenomic Analysis of Lysogeny in Tampa Bay: Implications for Prophage Gene Expression. PLoS ONE. 3, e3263-e3263 (2008). Williamson, S. J., Rusch, D. B., Yooseph, S. The Sorcerer II Global Ocean Sampling Expedition: Metagenomic Characterization of Viruses within Aquatic Microbial Samples. PLoS ONE. 3, e1456-e1456 (2008). Lang, A. S., Rise, M. L., Culley, A. I. RNA Viruses in the Sea. FEMS Microbiol Rev. 33, 295-295 (2009). 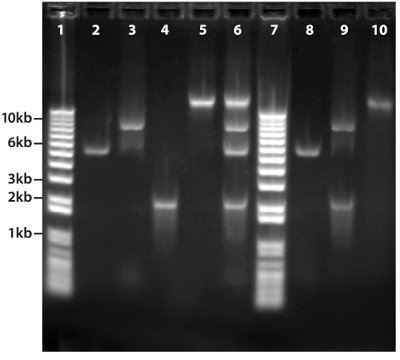 Ng, T. F., Manire, C., Borrowman, K. Discovery of a Novel Single-Stranded DNA Virus from a Sea Turtle Fibropapilloma by using Viral Metagenomics. J. Virol. 83, 2500-2500 (2009). Rosario, K., Duffy, S., Breitbart, M. Diverse Circovirus-like Genome Architectures Revealed by Environmental Metagenomics. J Gen Virol. 90, 2418-2418 (2009). Culley, A. I., Lang, A. S., Suttle, C. A. Metagenomic Analysis of Coastal RNA Virus Communities. Science. 312, 1795-1795 (2006). Bernardi, G. Chromotography of Nucleic Acids on Hydroxyapatite. Nature. 209, 779-779 (1965). Andrews-Pfannkoch, C., Fadrosh, D. W., Thorpe, J. Hydroxyapatite-Mediated Separation of Double-Stranded DNA, Single-Stranded DNA and RNA Genomes from Natural Viral Assemblages. Applied and environmental microbiology. 76, 5039-5039 (2010). Wommack, K. E., Colwell, R. R. Virioplankton: Viruses in Aquatic Ecosystems. Microbiol Mol Biol Rev. 64, 69-69 (2000).